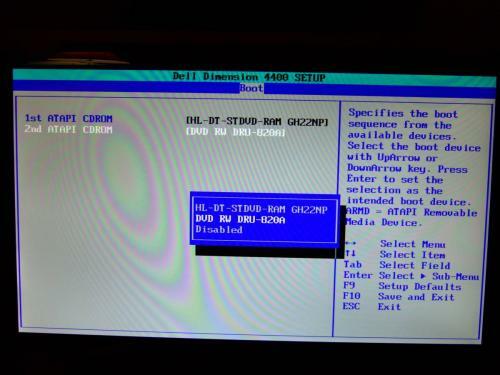 Question about CD/DVD rom drives being disabled in BIOS. 2.On the Hardware tab, click Device Manager. 3.In Device Manager, expand DVD/CD-ROM drives, and then right-click the CD drive that you want to update. 4.Click Update Driver to start the Hardware Update Wizard, and then follow the instructions that appear on the screen to install the latest driver for the CD drive. 5.Test to determine whether the issue is resolved. Edited by phillpower2, 21 January 2012 - 06:33 PM. Please see the EDIT I added to my last reply. 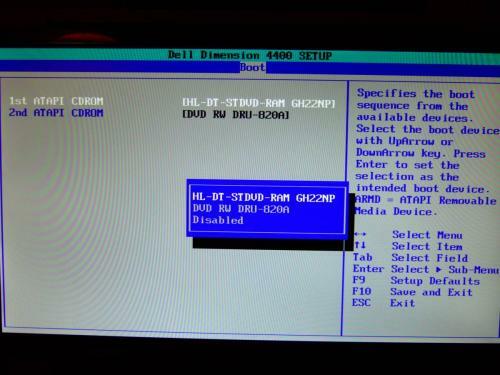 Well, I can't remember exactly which page in the BIOS, but you can click on the individual drives, and it says disabled, with no option to "enable".........I thought that was really strange. Like I said, maybe there is something simple that I missed, but it's pretty straightforward and there isn't hundreds of options, know what I mean? But still, I could have missed something that was right in front of me. 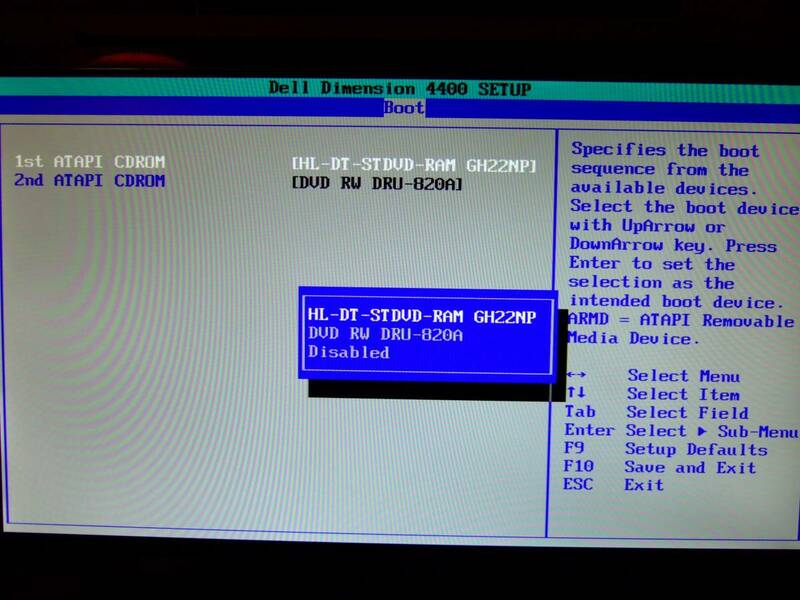 Yep I know what you mean as in BIOS settings are not generic, see if the info @ http://www.hiren.inf...bios-boot-cdrom helps, some BIOS you have to highlight the option and press Enter to enable them and some the space bar to enable them which are just 2 examples. I'll check that out in a bit. I know you know what I'm talking about, but just for the heck of it, here are a couple screen shots of both drives selected on the boot page. So what actually happens when you press Enter while the CD drive is selected? Well, the smaller blue window in the middle of the screen is what comes up when enter is pressed with either drive selected. You can see it highlighted in white in the background. Is that what you meant? Yes that is what I mean, have you tried pressing Enter again to see if it changes from disabled to enabled. Nope.....if I press enter again, it simply closes that smaller window. It's weird.....if I arrow down to 'disabled' and hit enter, the window closes and shows that drive in the bigger window with 'disabled' to the right. I don't get that. No option to enable though.......maybe that's not even what that's all about. That's foreign territory for me, I just saw that it says disabled and thought it was strange. I should check my wife's computer.....she has basically the same Dell....just a year newer. 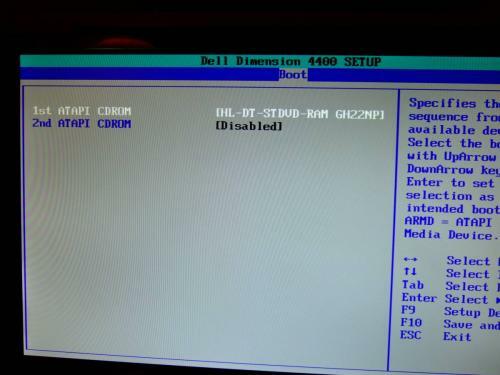 This is strange, the directions for changing the boot sequence are even visible in your screenshots it as if your BIOS has become damaged, would you be comfortable pulling the CMOS battery if I provide the directions for you. Yeah, I've opened the case up quite a few times.....changed the drives, added memory, changed the power supply, etc. It's just a little watch battery on the motherboard, from my understanding. And, as far as configuring the BIOS after doing that, I'd simply have to go in and change anything that I had previously changed. That being said, the only thing I've ever changed, that I can remember, is the AGP aperture, so If I change the battery, the only thing I'd have to change is that......does that sound accurate? How would the BIOS get damaged......does it "just happen" sometimes? Just to add........I can change the boot sequence, but that doesn't solve anything, I already tried that. Just to clarify..........not sure if that's what you meant. Edited by Jim45, 22 January 2012 - 03:03 PM. You will not have any trouble changing the battery with what you have done previously. Technically speaking when you choose the default settings in the BIOS the factory default settings should be restored this however is not always the case and pulling the battery or moving the jumper cap needs to be done, pulling the battery is easiest. Upon first boot you should only need to reset the time and date in the BIOS, Save (F10), Exit and Y to accept the changes. Sounds simple enough.......since it has never been pulled,I'm going to get a brand new battery. I read the average life is about 10 years, and this computer is approaching that. So, do I simply pull the battery, and put in the new one? I thought I remember having to wait a few minutes, or a half hour......can't remember. You saw what I said about changing the boot sequence, yes? You still think the BIOS is damaged? I heard that strange behavior is a sign. Edited by Jim45, 22 January 2012 - 03:32 PM. 9-10 years is a good battery life but they do generally outlive the actual computer. So, do I simply pull the battery, and put in the new one? I thought I remember having to wait a few minutes, or a half hour......can't remember. Remove the battery, press and hold the power button to dispel any residual charge in the system, wait a couple of minutes and then replace the battery. As ever ensure all power cords are disconnected from the wall socket/s. Just to add yes the BIOS behavior is odd, try pressing the Tab key or Space bar when the drive is selected to see if that does anything.